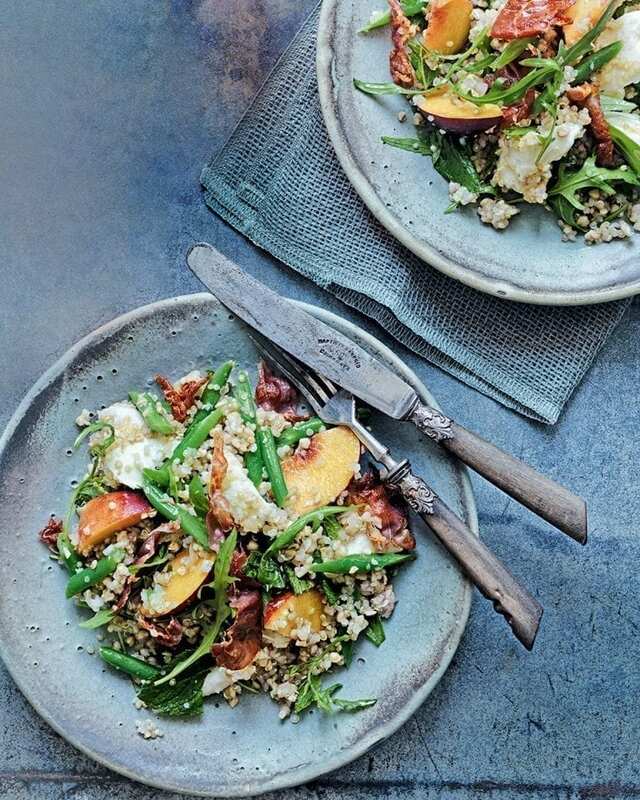 If you’ve never tried peaches in a salad, you need to try Ghillie James’ wonderful recipe which combines mozzarella, parma ham and gluten-free grains. Heat the stock in a pan, then add the buckwheat and quinoa. Bring back to the boil and cook for 10-15 minutes until the grains are tender, adding the beans/sugar snaps for the final 1-2 minutes. Drain and set aside to cool. Meanwhile, dry-fry the parma ham over a high heat for 1 minute or until beginning to crisp (it will turn completely crisp once cooled). Transfer to a plate and set aside. Combine the lemon juice, olive oil and a generous sprinkling of salt and pepper in a large bowl, then add the cooled grain mixture. Add the peaches, rocket, mozzarella, mint and half the crispy parma ham, roughly broken, and toss together. Pile onto a platter and top with the remaining crispy ham pieces. Serve straightaway. Next time use sliced ripe figs and crisp slices of pancetta instead of peaches and ham. You can replace the buckwheat and quinoa with wheat berries, couscous or barley. This recipe is by Ghillie James. See more of the recipe books she’s written. What’s our problem with quinoa?